I love the movie Looking for Alibrandi, and I especially love the opening scene where multiple generations of Josephine’s family are gathered in the backyard making Passata. The ritual alone is lovely, never-mind all the wonderful sauce that is produced! Making passata can be as simple or as involved as you like. For us, we like to keep it simple. Our version includes only tomatoes and white wine. We recommend not adding salt, herbs or any other flavours. This way your sauce can be as versatile as possible and you add the flavours needed when you’re ready to use the sauce in a recipe. 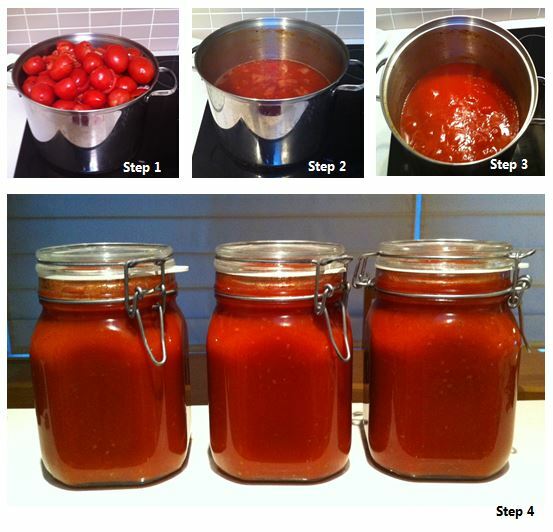 Using 1kg of tomatoes you’ll produce 3 x 1 litre jars of passata. If you’re interested in a true Italian method of creating Passasta, check out this recipe from Giovanni Pilu. What’s your favourite recipe that uses passata? We’d love you to share it with us below.